Muslim voters overwhelmingly backed George Bush four years ago, to the point that some conservative commentators cited that support as a key reason Bush is sitting in the White House. But as a new poll of Muslim voters further confirms, the landscape has radically shifted. Tuesday’s poll, conducted by the Council on American-Islamic Relations in Washington, shows Bush running a distant third behind both John Kerry and Ralph Nader. A very distant third. Bush gets the support of only 2 percent of those surveyed, compared to 54 percent for Kerry and 26 percent for Nader. By comparison, a CAIR study shortly after the 2000 election found 72 percent of Muslims voted for Bush, and only 8 percent for Al Gore (Nader, who is of Lebanese descent and has spoken Arabic since childhood, got 19 percent). 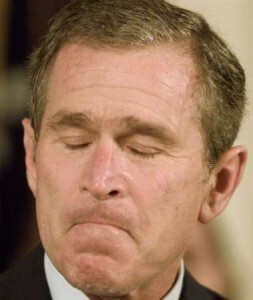 More than half of the 1161 individuals who responded to the new poll said they voted for Bush in 2000. But this is just the latest example of Bush’s declining popularity among a voting bloc he once dominated. In April, a Zogby poll of Arab-American voters in the four key battleground states (Florida, Ohio, Pennsylvania and Michigan) showed Bush trailing Kerry among all Arab-Americans in each states and faring even worse with Muslims. Only 10 percent of Muslims supported Bush, with both Kerry and Nader well ahead. It’s difficult to find a reliable estimate for the total number of Muslim voters in the U.S., as the Census does not list Islam among its religious categories, so estimates range from 2 million to 12 million. But the vast majority of Muslims register to vote and show up at the polls, making them an important support group in close races. Bush’s low approval ratings among Muslims are understandable, given his administration’s actions, particularly the Patriot Act. But it might go well for the Democratic Party.